Although the South Shore Country Club Park had been listed on the National Register of Historic Places in 1975, the Chicago Park District persisted in its plans to have the main building demolished. They planned to build a recreational field house in its place without substantiating to the community and community groups why the main building could not be rehabilitated instead. 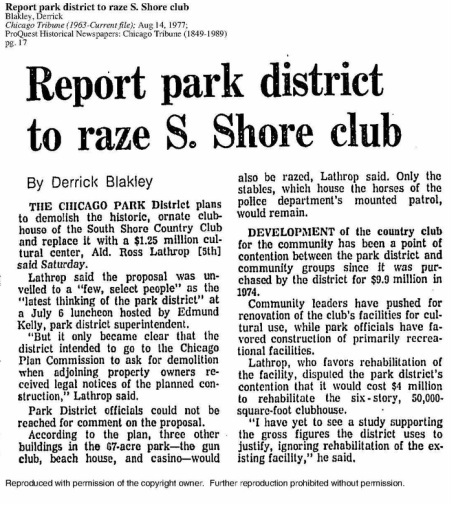 "On July 28, 1977, the Chicago Park District requested permission from the Chicago Plan Commission to demolish the main clubhouse and other buildings on the site of the South Shore Country Club. This request resulted in the coalescence of private citizens, community civic, architectural and preservation groups into the Coalition to Save the South Shore Country Club Park."